Without question, my favorite Peruvian dish is Aji de Gallina — a spicy and creamy chicken stew that made me fall in love with Peruvian food during a spicy epiphany many years ago. But only recently did I learn that its origins can be traced to Medieval Spain and to Roman and Arab cuisines. 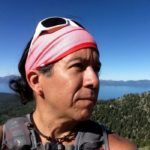 It’s a true comfort food for me, and a wonderful example of how a dish can evolve, transform, and taste uniquely Peruvian. 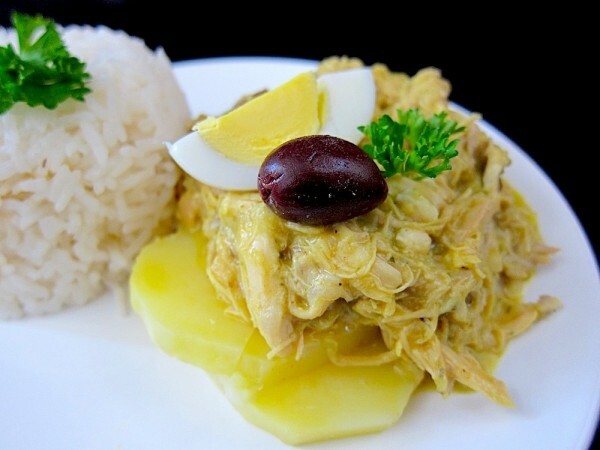 According to research done by Isabel Álvarez Novoa, a sociologist and expert on Peruvian cuisine, Aji de Gallina originated from a dish called Manjar Blanco which was a thick and creamy mixture of chicken, rice, almonds, and sugar. Once it arrived in Peru, the creole cooks quickly adapted it using local ingredients such as the aji amarillo, and a new dish, the Aji de Gallina was born. But the story doesn’t end there. Manjar Blanco is also the name of the sweet custard filling used in the Peruvian Alfajores. And food historians believe that the dessert version also originated from the chicken version, except that the chicken was removed when meat was not allowed in a diet during religious holidays. So as it turns out, one of my favorite Peruvian desserts is inexorably intertwined with my favorite dish. There are many variations but the recipe here is mine, and is the result of decades of cooking sessions in my mom’s kitchen. Some recipes call only for chicken breast but I find that also using dark meat gives added flavor. Aji amarillo is the key spice and I add some turmeric for added color. And though it takes patience to poach the chicken and slow cook the stew, after one bite you may just have your own spicy epiphany and fall in love with Peruvian food. 1 whole chicken breast, skin on, bone in, about 1 1/2 lb. 2 whole chicken legs, skin on, bone in, about 1 lb. 2 chicken thighs, skin on, bone in, about 1/2 lb. In addition to the ingredients above, you’ll need a stock pot to poach the chicken and a large pot to cook the stew. Peel and cut yellow onion into quarters, cut the celery and carrot into 1 inch chunks, slice 6 rounds of ginger, and collect 6 stems of fresh parsley. Put the chicken in a stock pot and cover with water by 2 inches, or about 10 cups of water. Add the onion, celery, carrot and salt, bring to a boil, and simmer partially covered until chicken is cooked, about 50 minutes total. Set chicken aside to let cool, strain and save chicken stock. Shred the chicken into long thin strands, discard the skin and bone. Soak slices of bread minus the crust in 1 1/2 cups of chicken stock and mash with a fork to make a purée. Dice the red onions, mince the garlic, chop the parsley, and grind the walnuts using a mortar and pestle. Prepare the sofrito by sautéing the onion and garlic with the canola oil in a pot over medium to high heat. Cook until onion is translucent. Add the aji amarillo, salt, pepper, cumin, oregano, and turmeric and continue to sauté until all the spices are mixed well. Add the parsley and bread purée, mix well, reduce heat and cook until the mixture begins to simmer. Add 3 cups of chicken stock, cook until it begins to simmer and then add the shredded chicken. Stir occasionally and continue to simmer partially covered until stew thickens, about 45 minutes. Remove from heat and stir in ground walnuts, parmesan, and milk (optional, for a creamier consistently). Serve over slices of cooked potatoes with a side of steamed rice and garnish with a hard-boiled egg, black olive, and sprig of parsley. To test for doneness when poaching the chicken, remove a piece of chicken from the pot, and pierce with a fork or knife. The chicken is done when the chicken releases clear juices. I used country bread from Tartine Bakery, crust removed and broken into crumbs to measure about 2 cups loosely packed. The stew is done when it has reached a thick and creamy consistency, or when you can see the bottom of the pot when stirring the stew with a spoon.